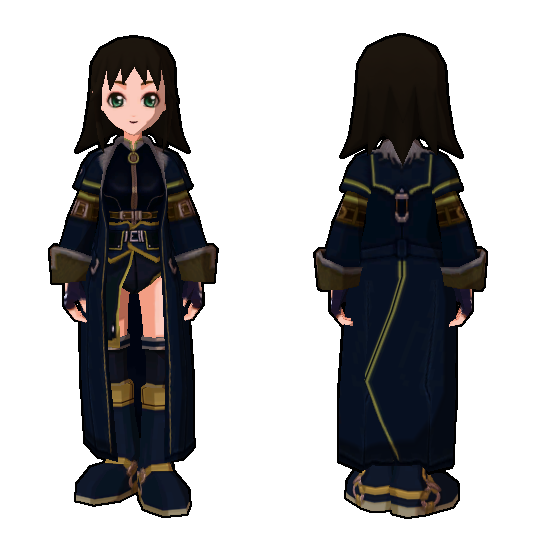 Special thanks to Mythyc of Onyx (4) for making and modeling the Upgraded HLA Robes. 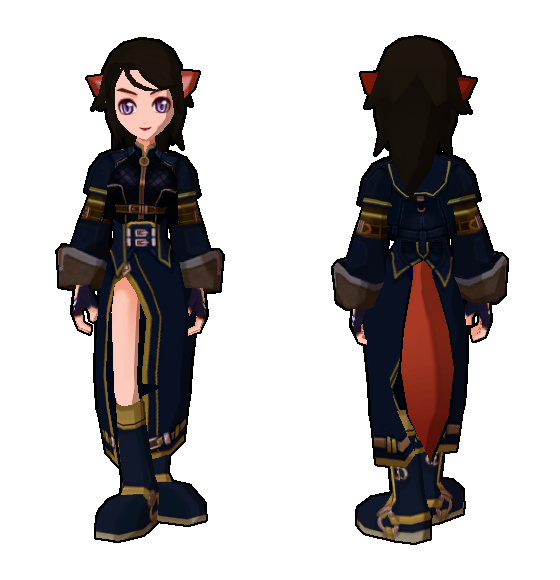 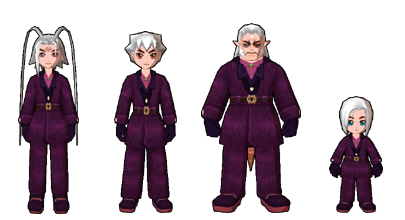 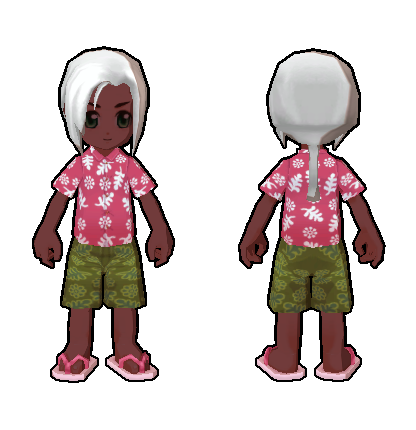 The Robe pants are glitched to look like the Upgraded 60 Clothing pants on Human and Sprite, same as Female. 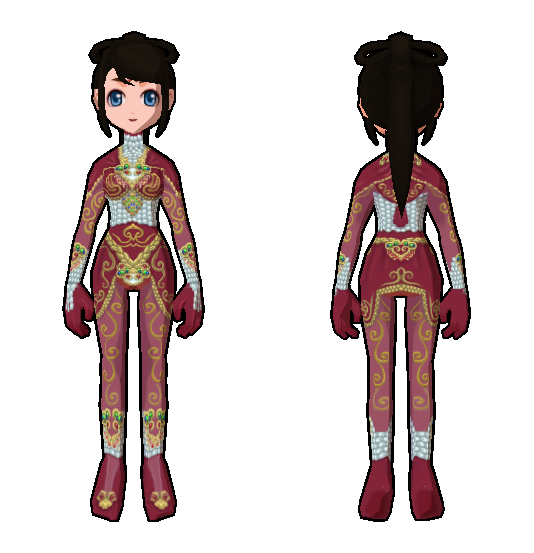 Special thanks to Angol_Moa of Sapphire (3) for making and modeling the Upgraded HLA LA. 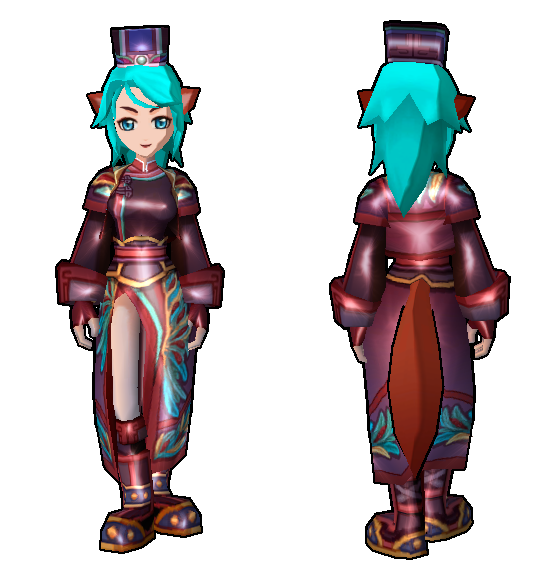 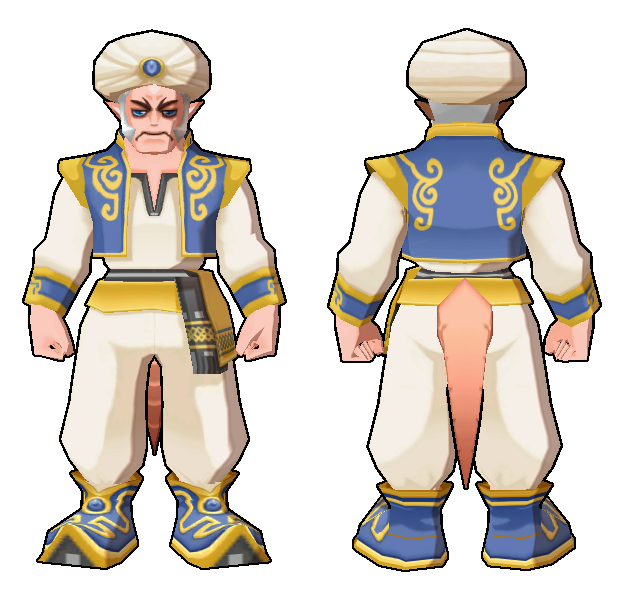 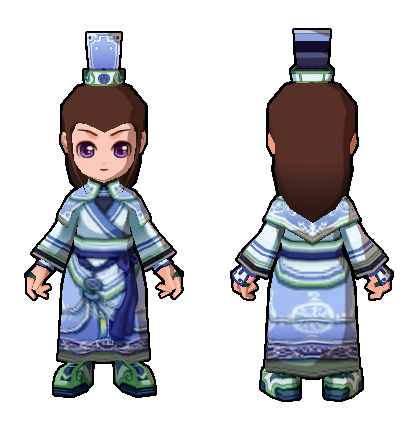 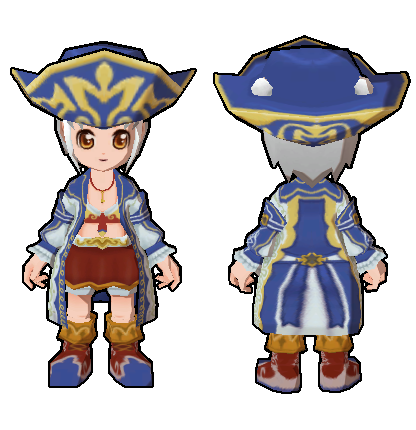 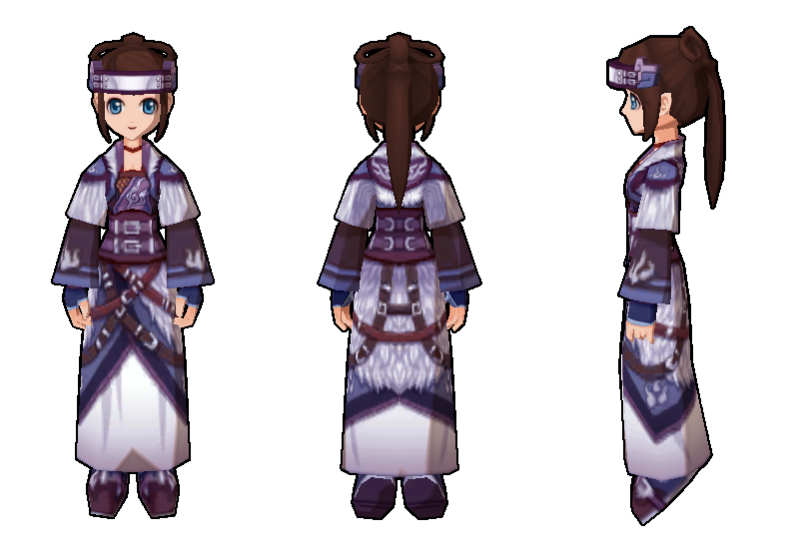 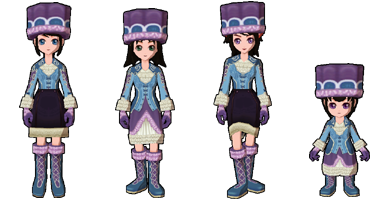 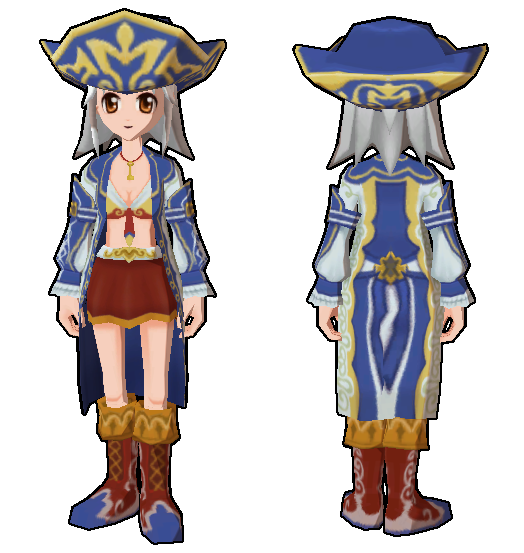 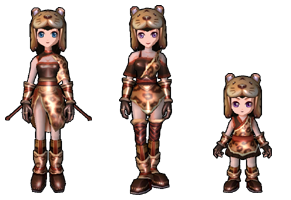 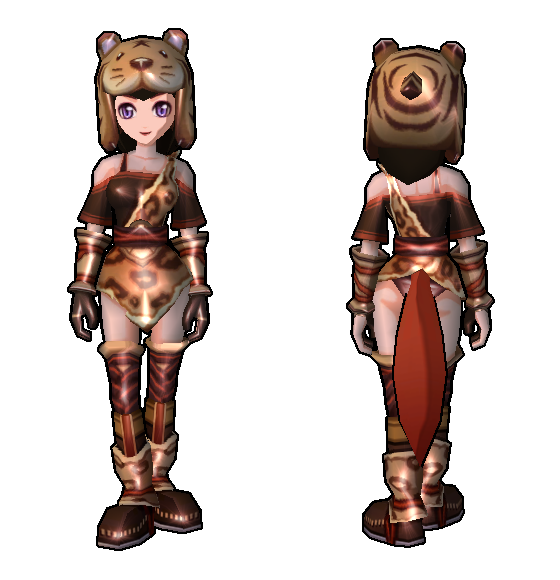 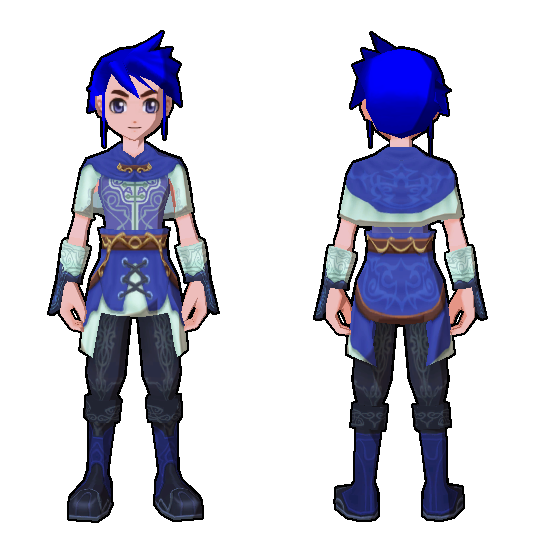 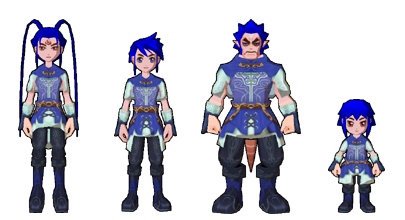 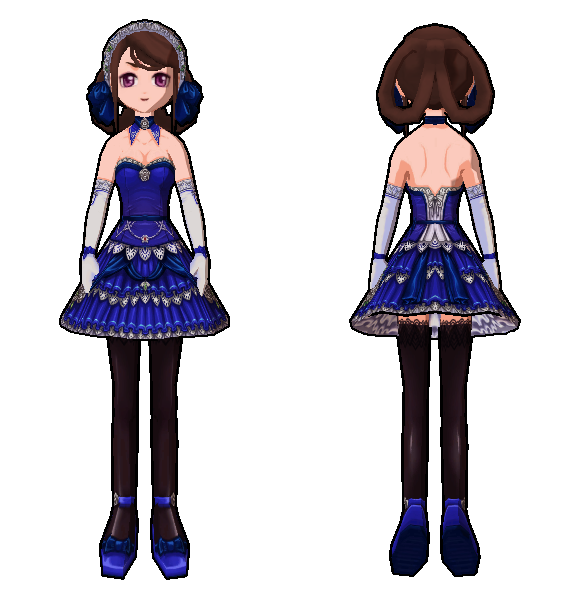 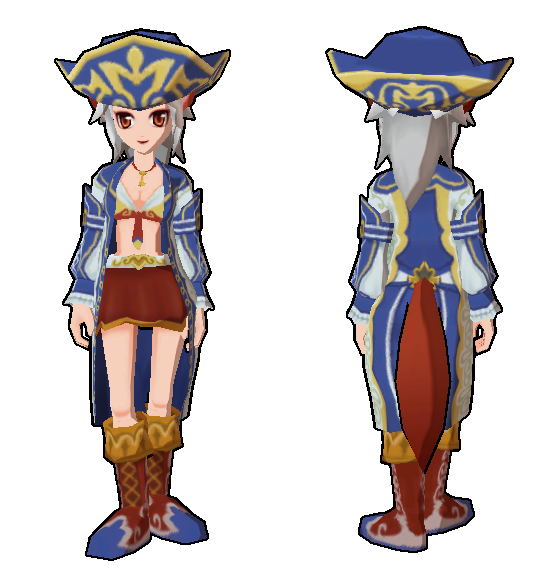 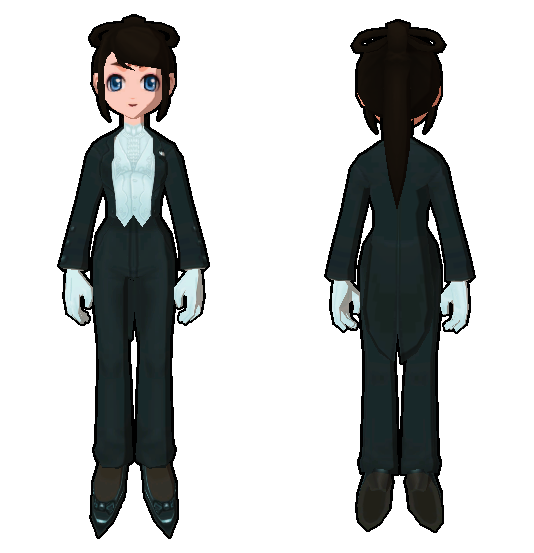 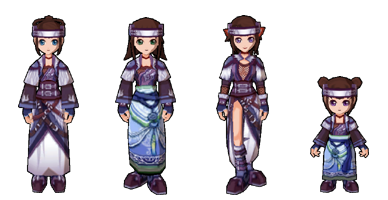 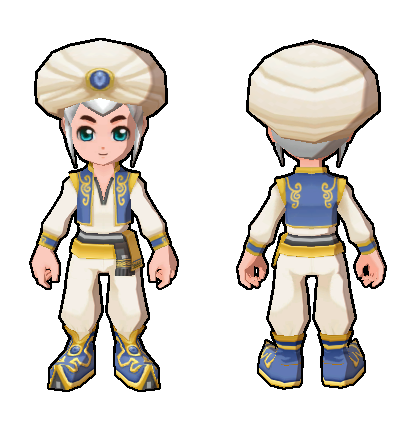 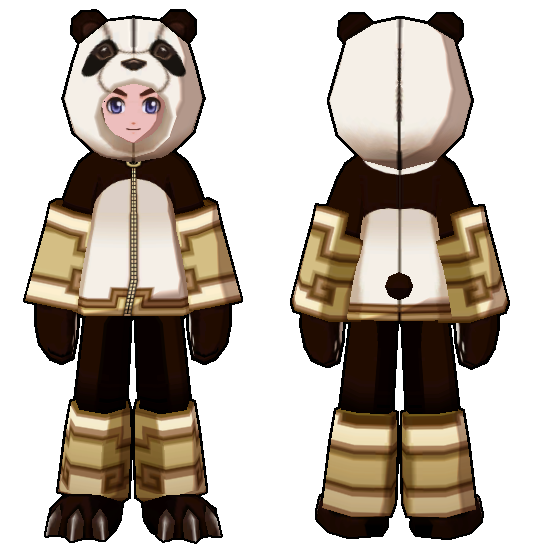 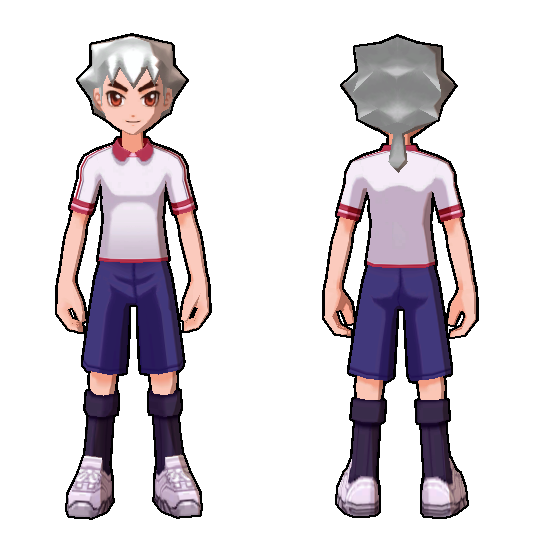 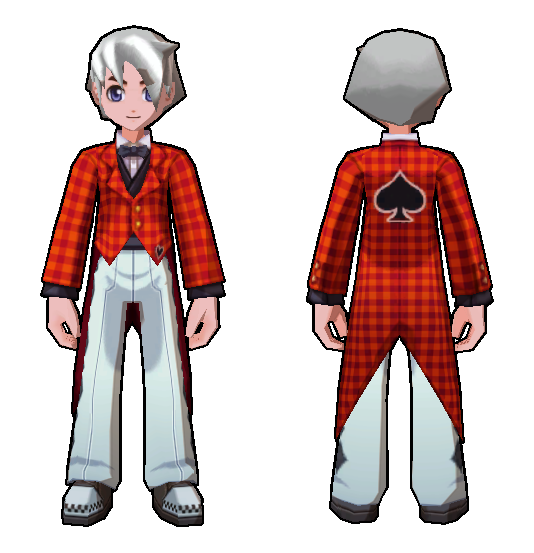 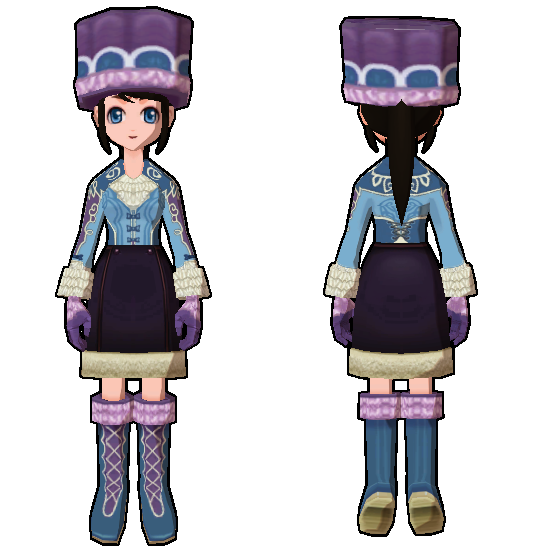 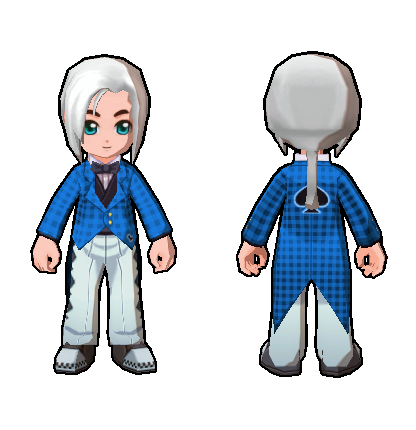 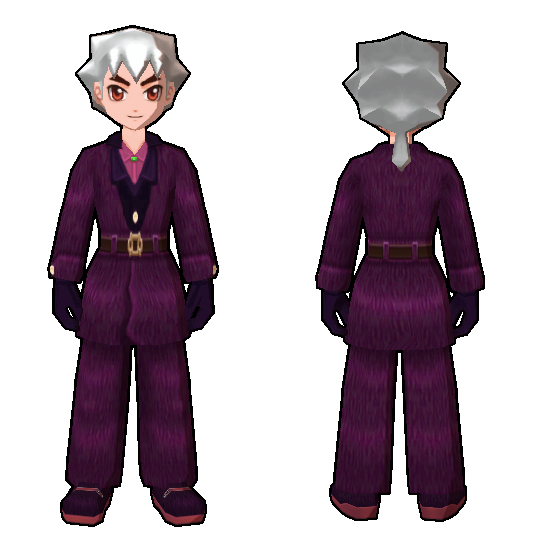 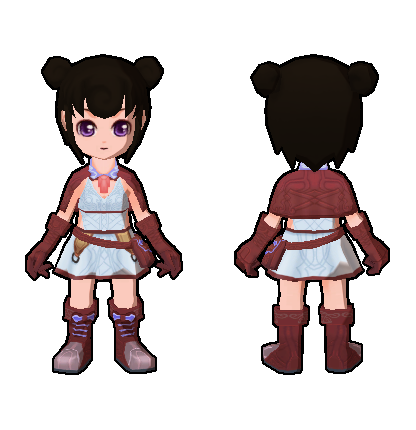 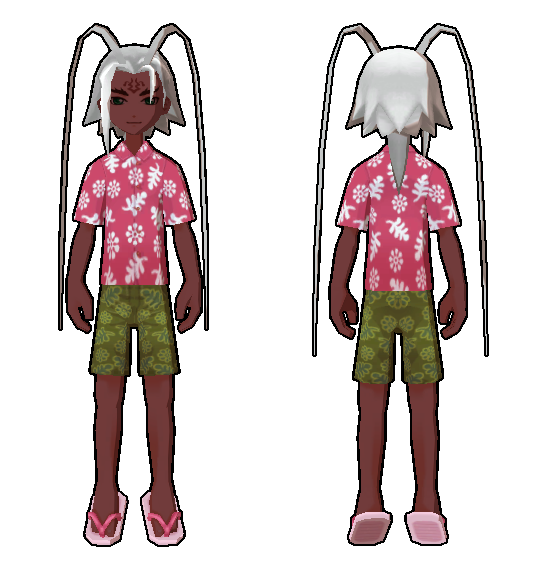 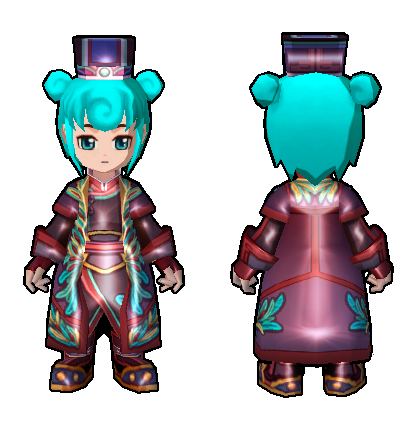 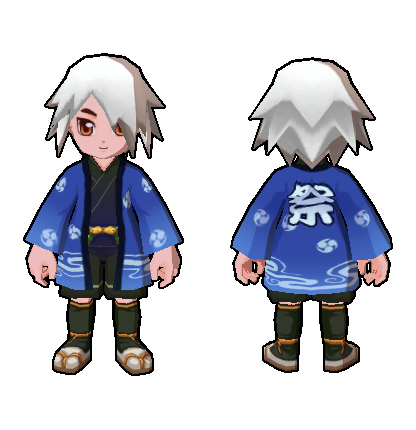 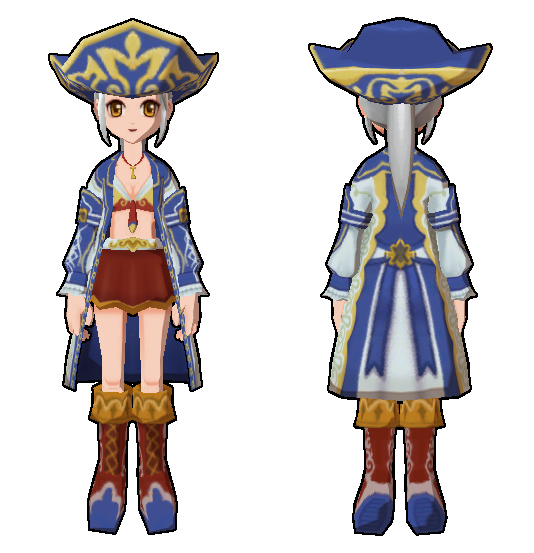 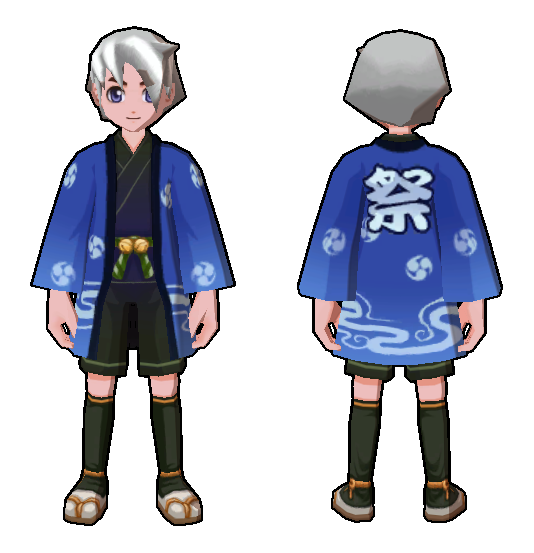 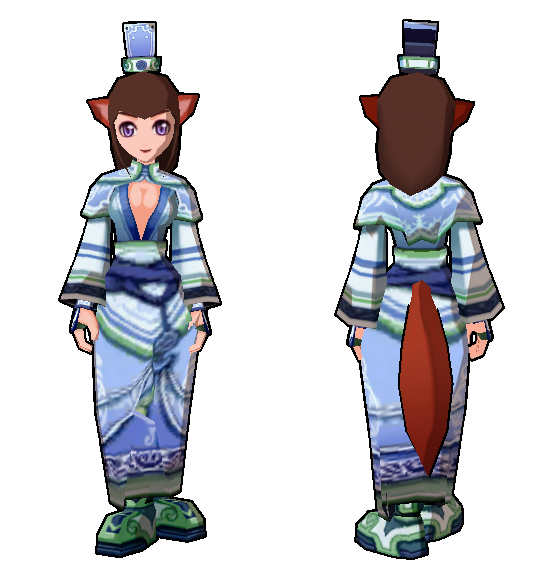 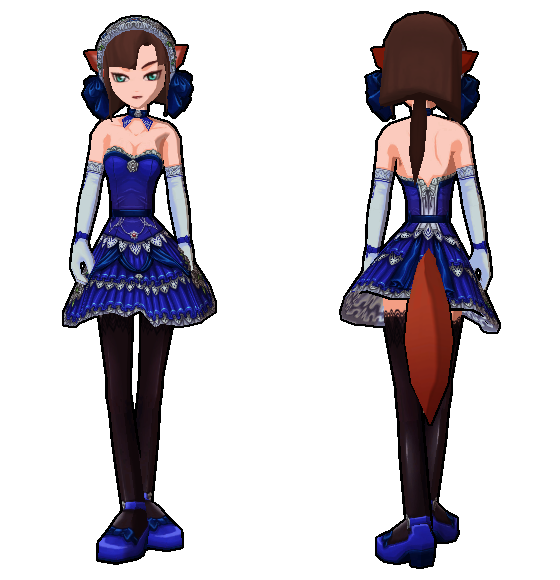 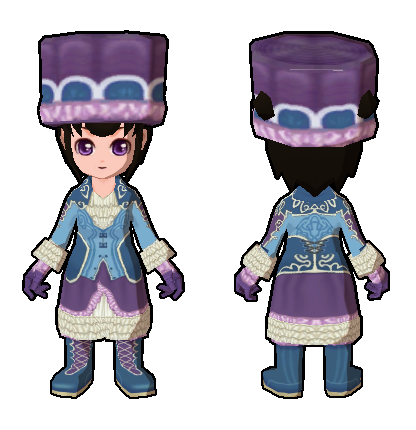 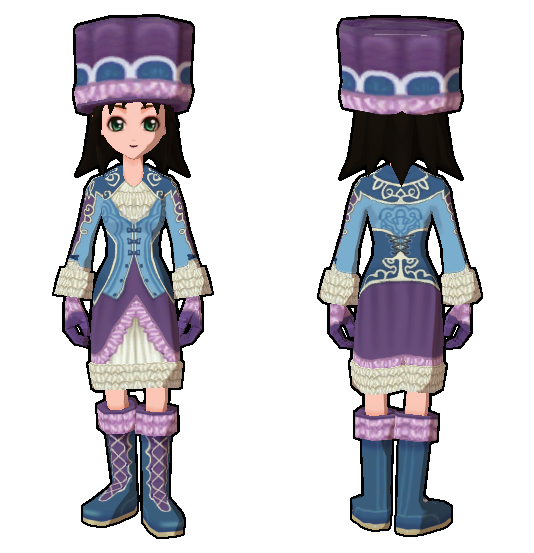 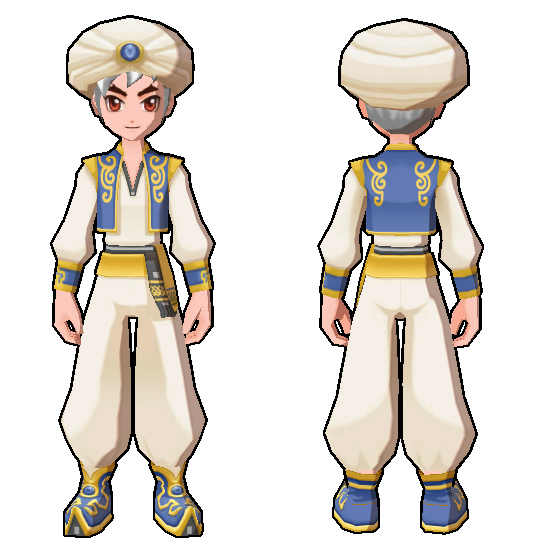 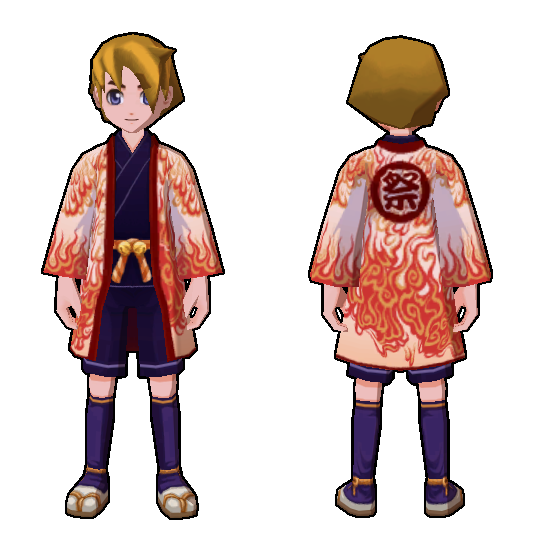 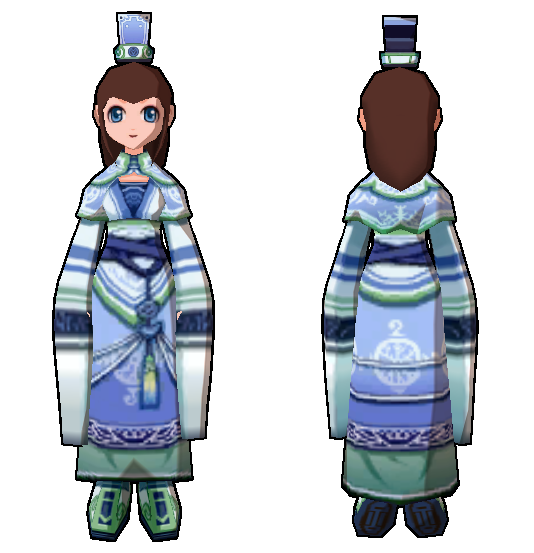 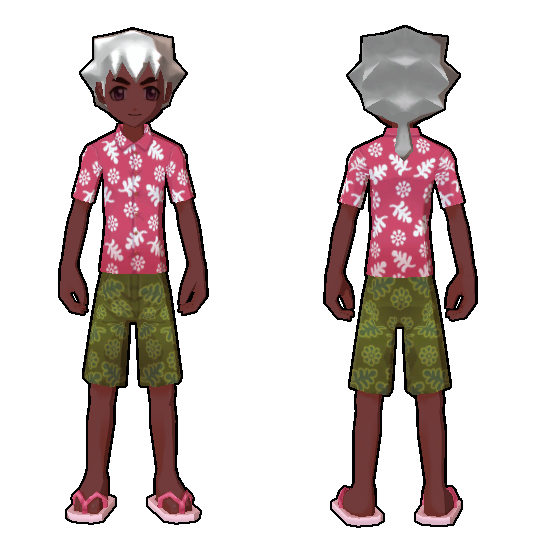 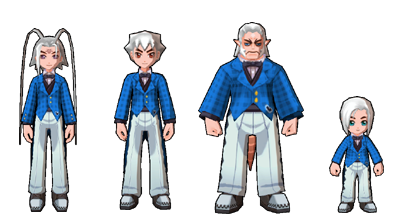 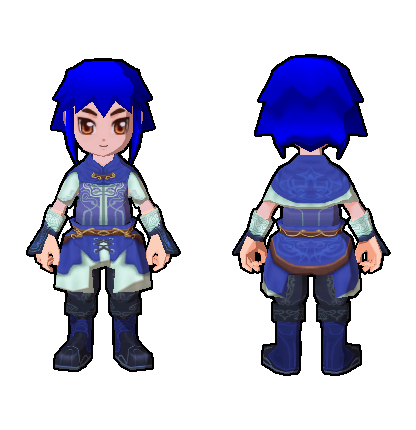 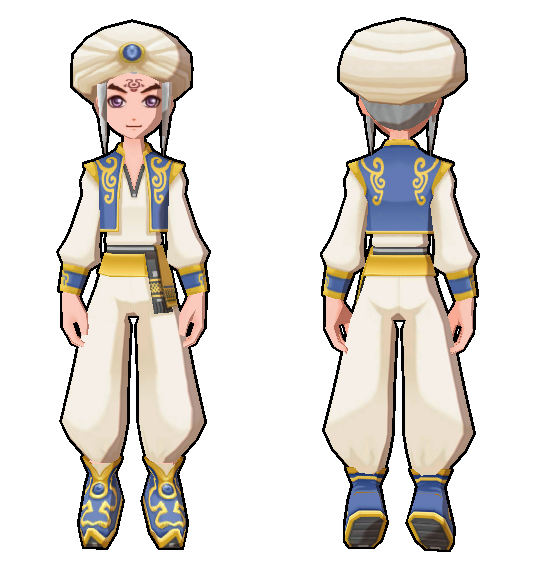 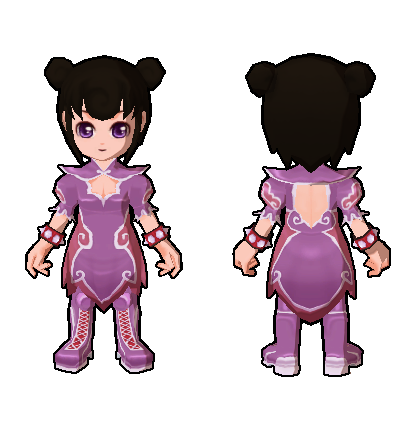 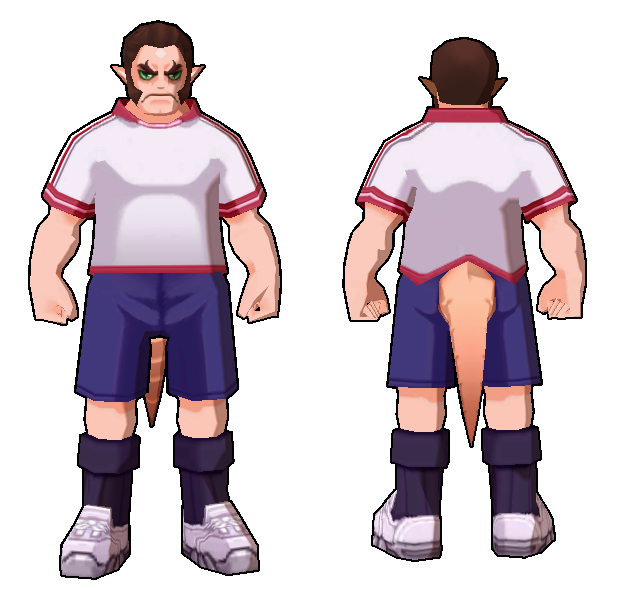 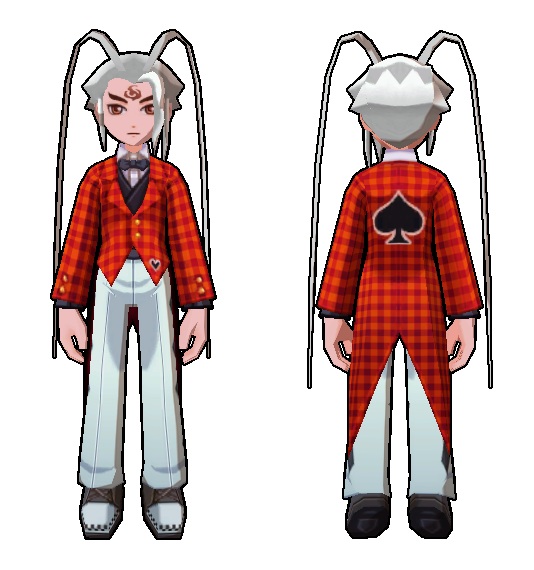 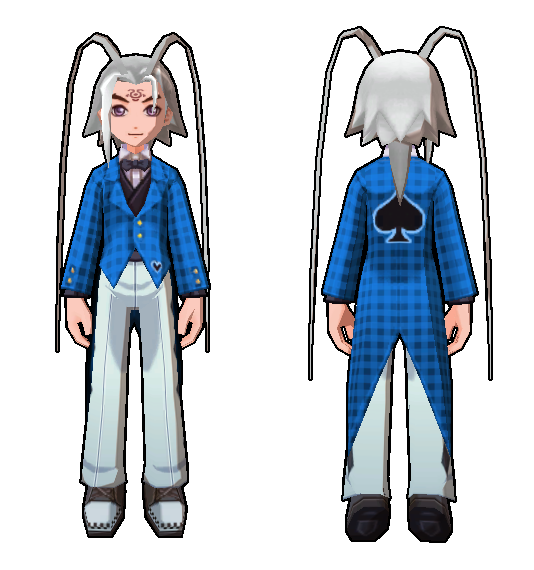 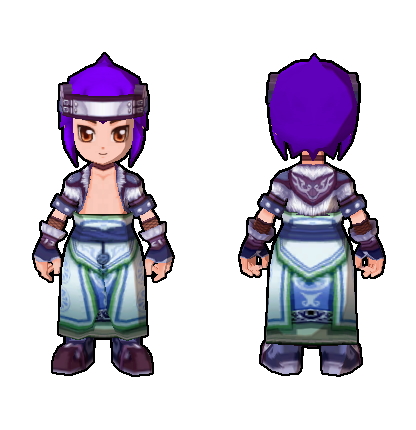 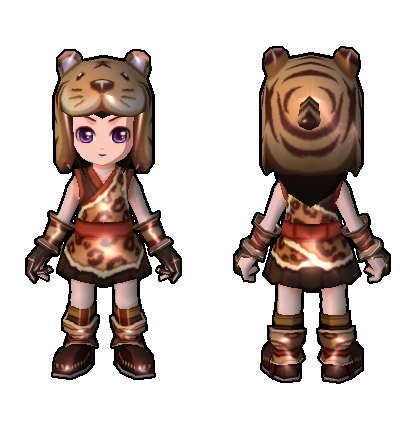 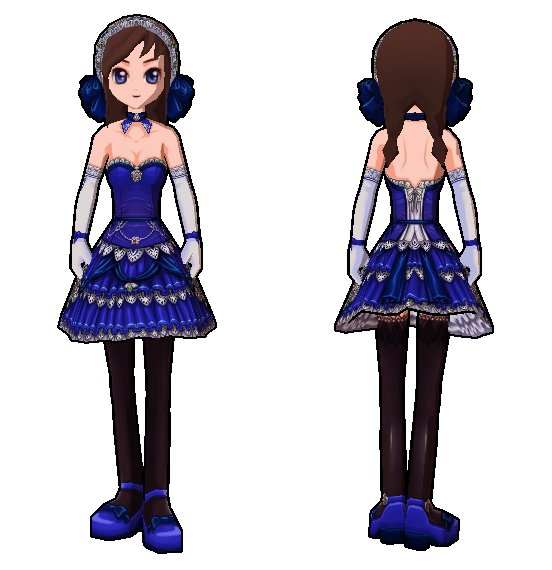 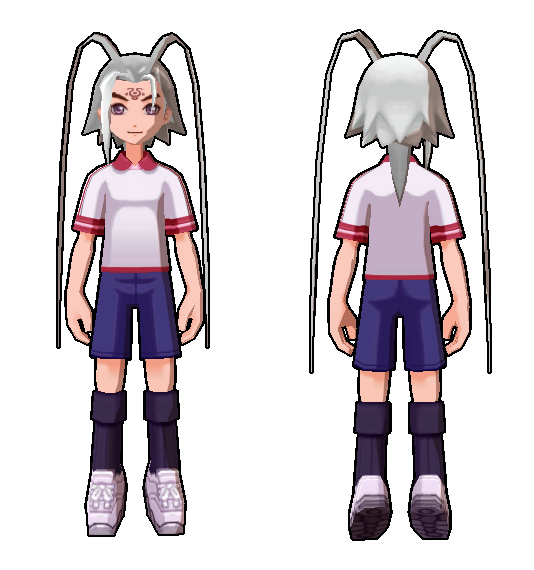 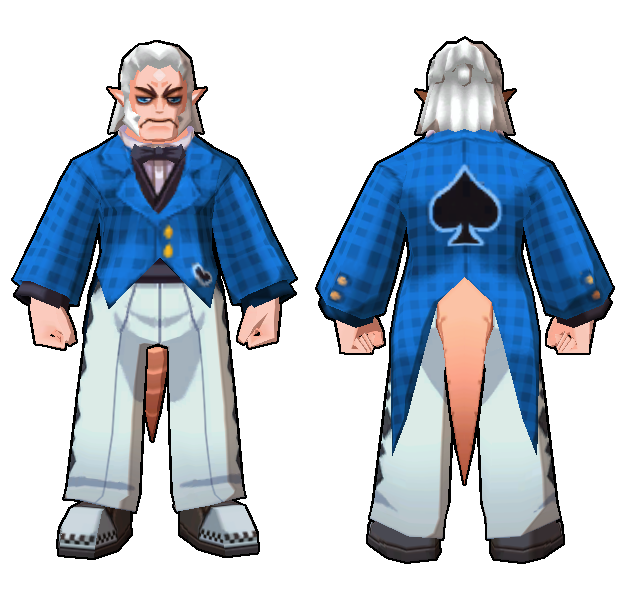 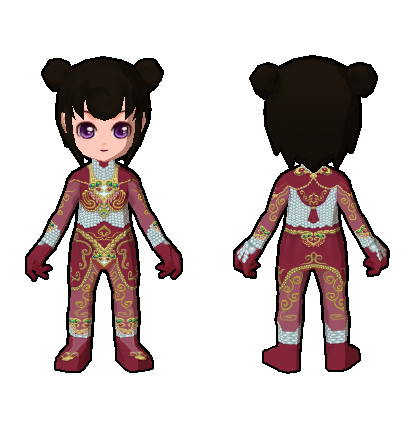 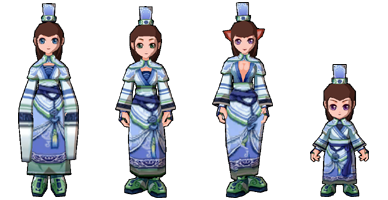 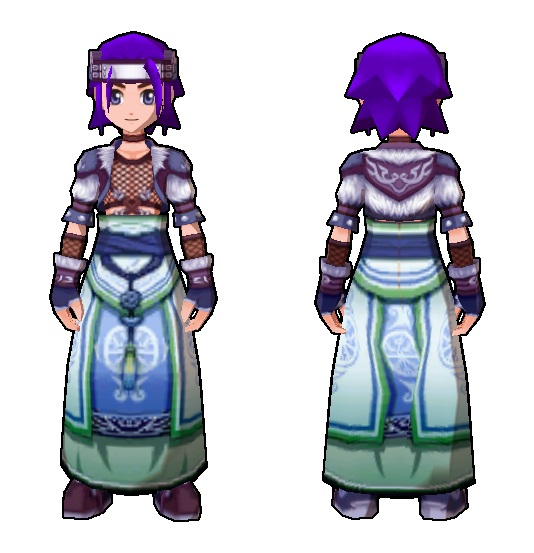 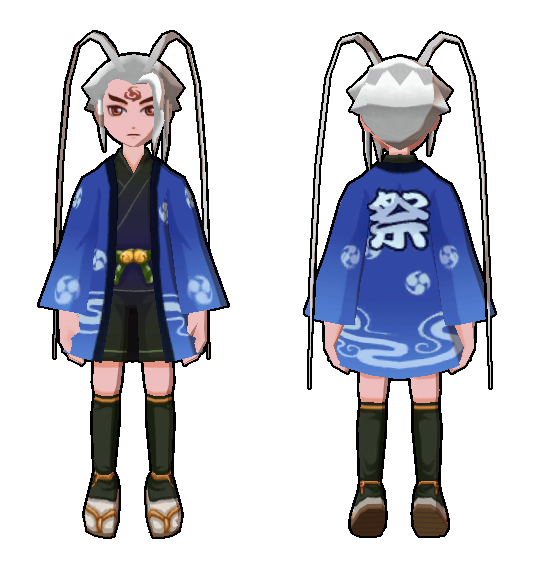 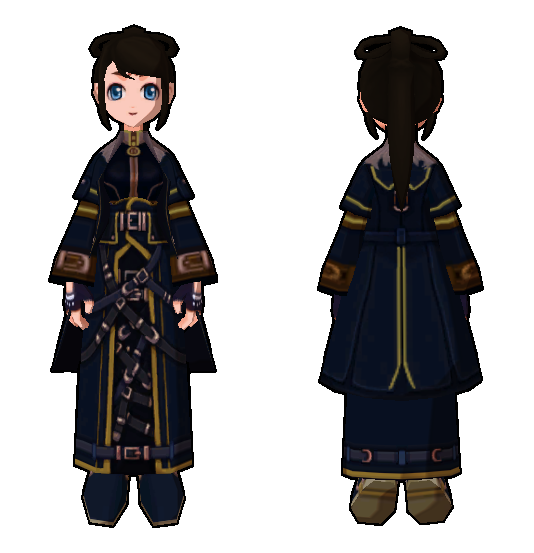 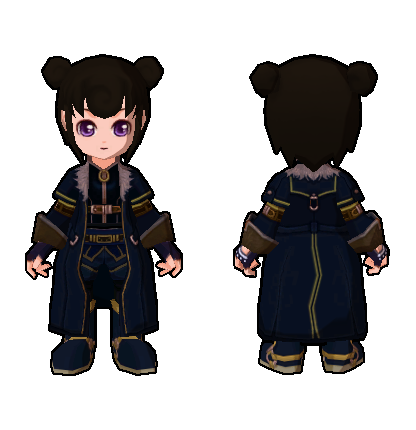 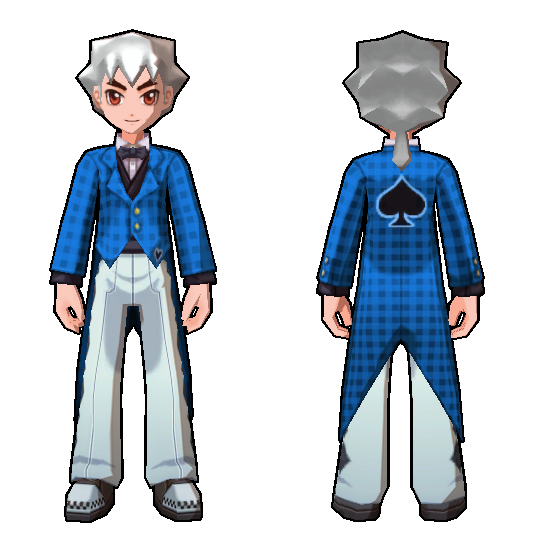 Special thanks to myself for making the Upgraded 60 Clothing, and my alt Shufei of Sapphire (4) for modeling it. 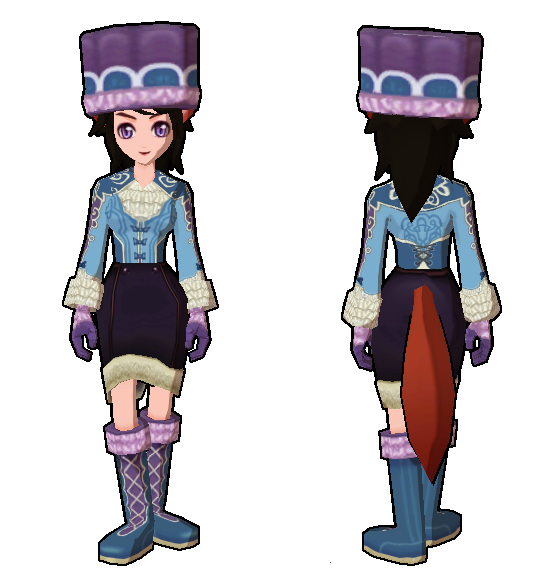 There is one extremely obvious glitch with this set, which is that the hat gives you 'hat hair' as if you were wearing a helmet or such. 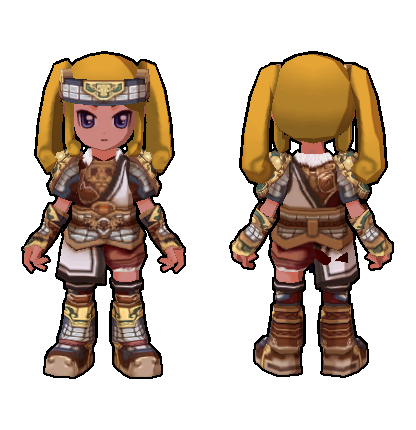 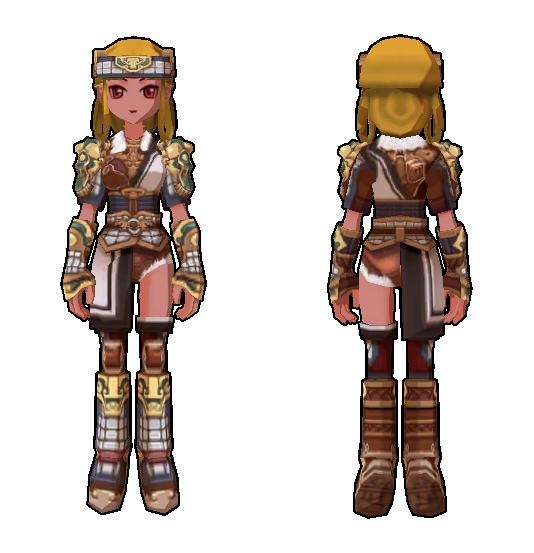 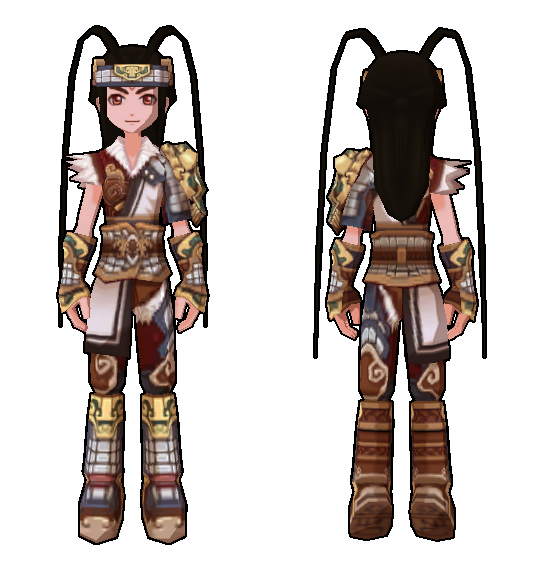 A tested a few costume headgears and they made her hair look normal and not glitched (though I don't have an Emperor's New Hat to try). 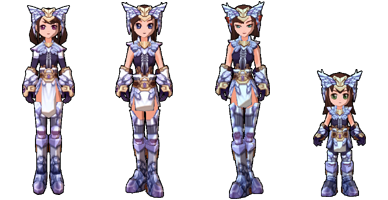 There is also one less obvious glitch which only occurs on Sylph Female: the Sylph Sleeves (<3) don't remove the arms like all other Sylph Sleeves do, and you can see the hands (and large armor gloves, if you happened to be wearing any- example) poking through them. 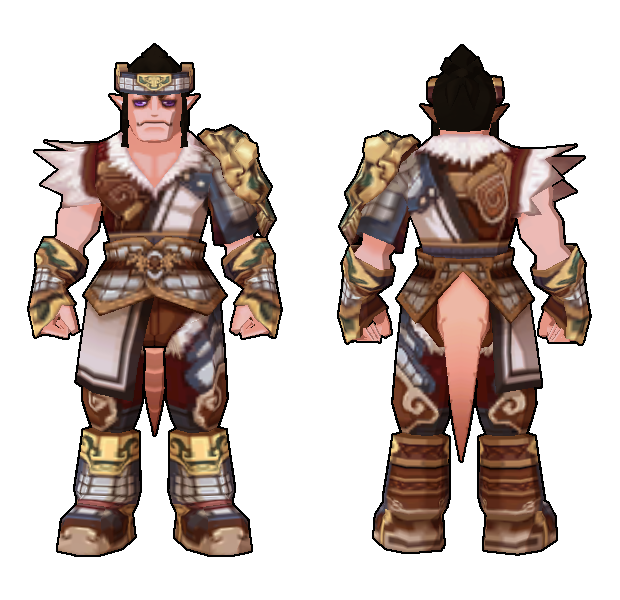 I guess now we know where the Thor Armor (Upgraded 60 HA) Sylph Male's Arms went. 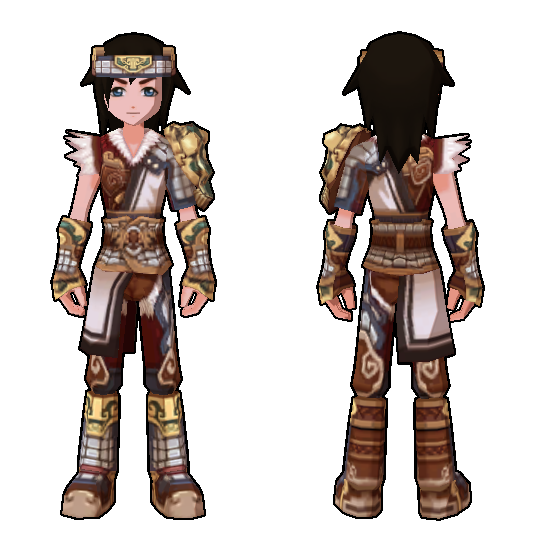 Special thanks to Angol_Moa of Sapphire (4) for making and modeling the Upgraded HLA HA. 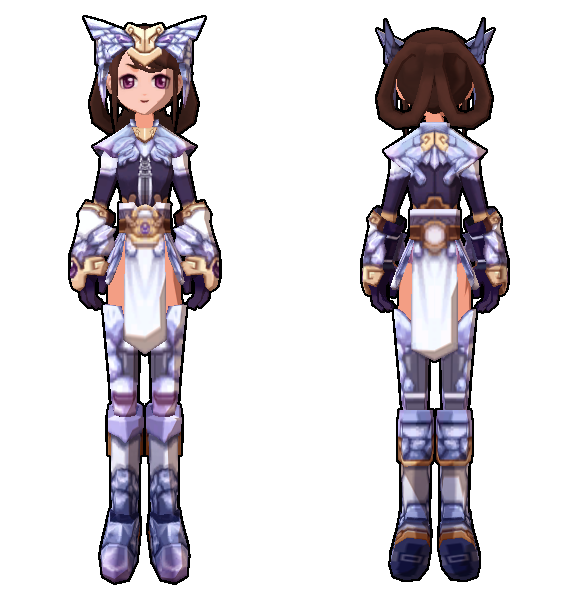 And yes this is really how it looks like. 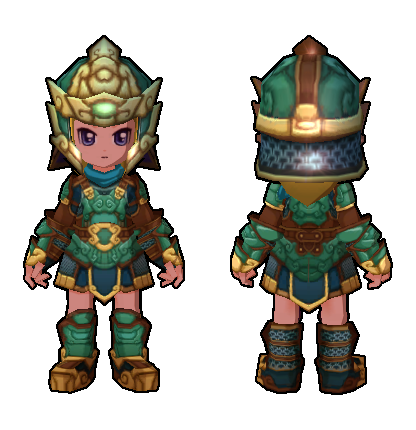 I was expecting something more like this myself.. but instead only the helmet is shiny. 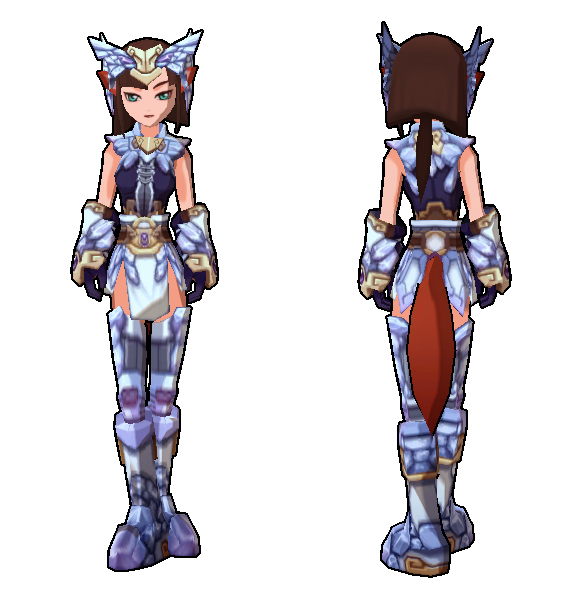 Special thanks to xPurex of Sapphire (4) for making and modeling the Upgraded HLA LA. 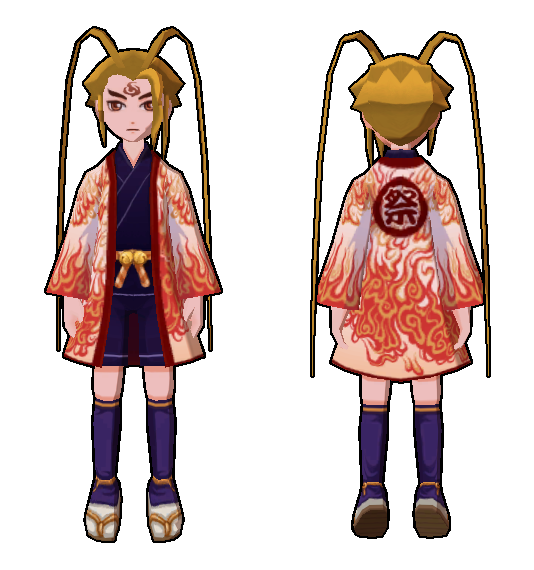 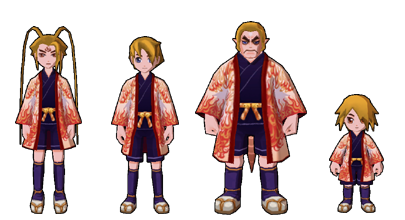 I might be able to post Upgraded Lv60 Robes sometime soon, but depends on whether I can some get Lv60 Robe shoes somehow or not (the only piece I'm missing). 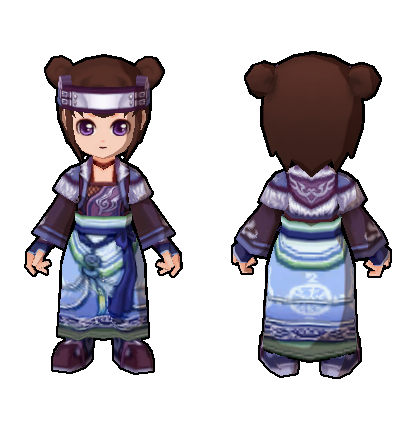 Special thanks to Lanniang of Sapphire (Me!) 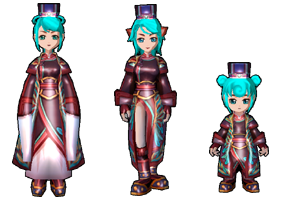 (4) for making and modeling the Upgraded HLA Robes, and Arika_Yumemiya of Sapphire (4) for making and modeling the Upgraded 60 LA. 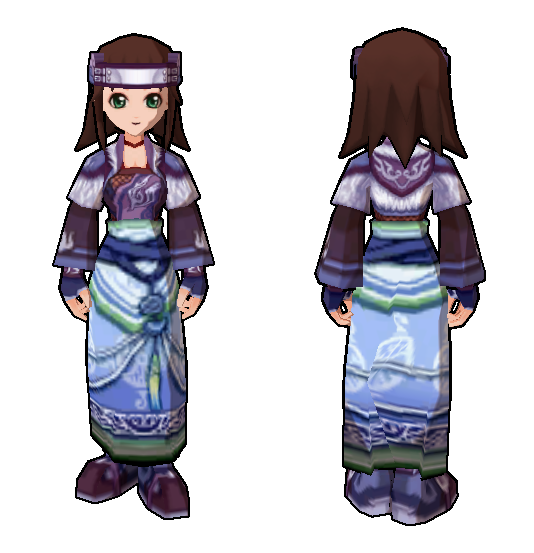 The Robe pants are glitched to look like the Upgraded 60 Clothing pants on Human and Sprite. 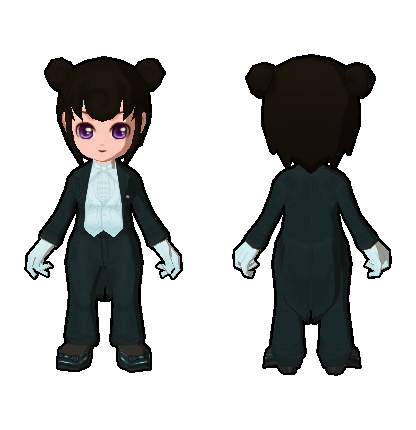 I'm looking for anybody else who may have made, or may make in the future, one of these full new 70 sets to help model for the site. 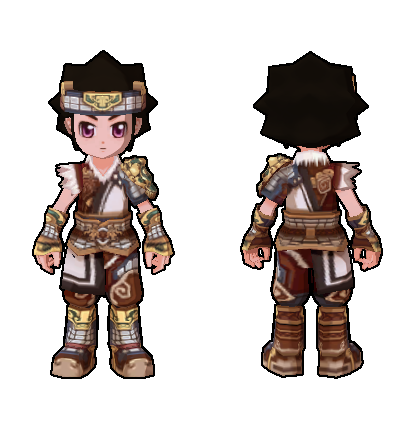 Even if it has obvious glitches or looks like another set, as long as it's the full set I will still screenshot it. 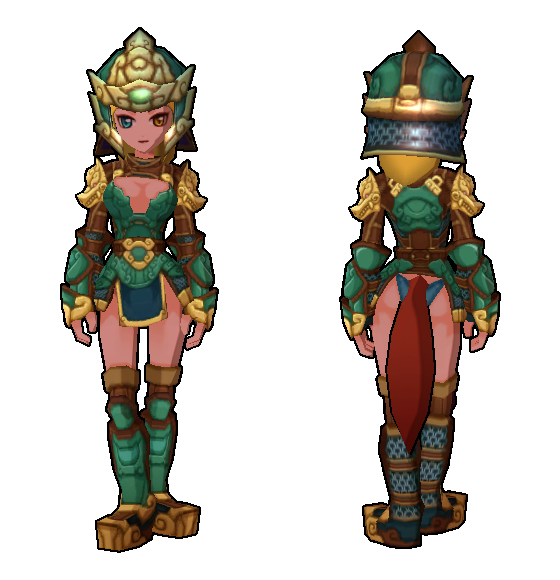 The new upgrade system for armor includes a way to obtain the two previously unseen armor skins for each armor type (except HA, where one of the looks is a repeat of 50). 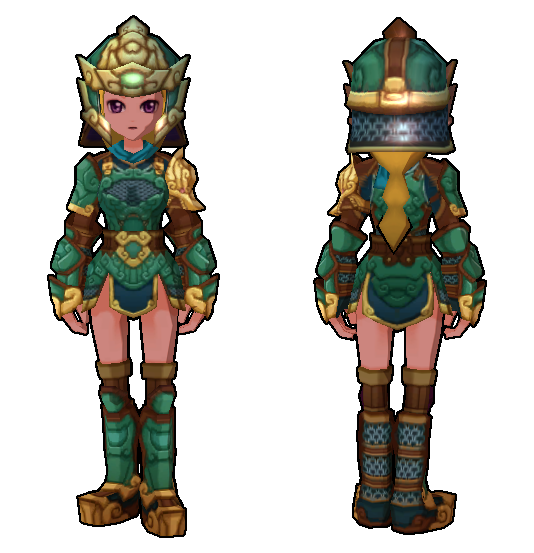 This involves taking level 60 armor and upgrading it to 70, or upgrading HLA armor (level doesn't change). 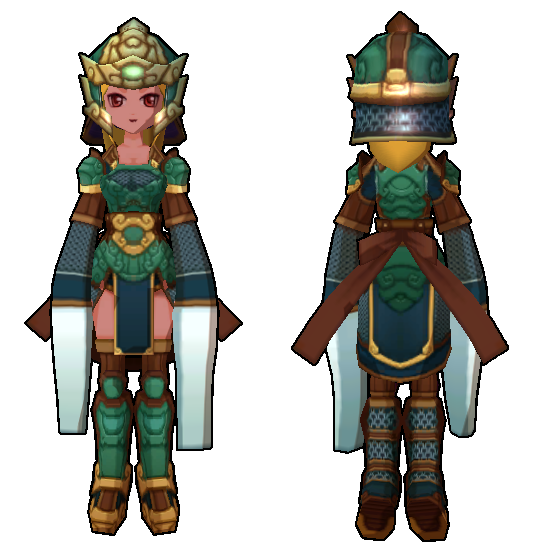 These methods both result in different armors, not the same ones. 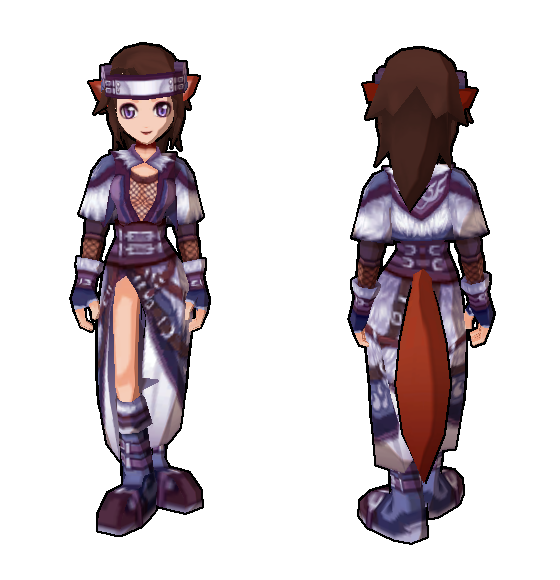 In short, I'd like to get models for all of these if possible and consider it high priority. 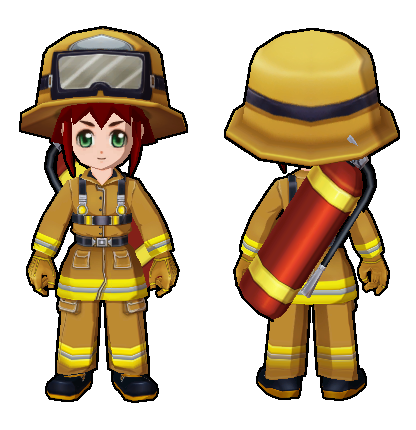 Missing Lists and Model Information pages have been updated accordingly. 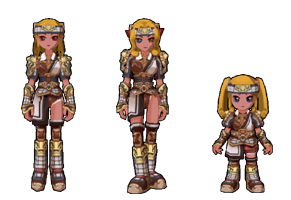 I have added a few examples from an old shoot I was able to get with GMewok (3). 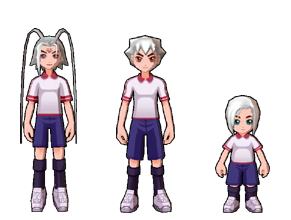 Based on my reference these should be correct, but I have not personally verified them ingame and will replace them if it turns out I was wrong. 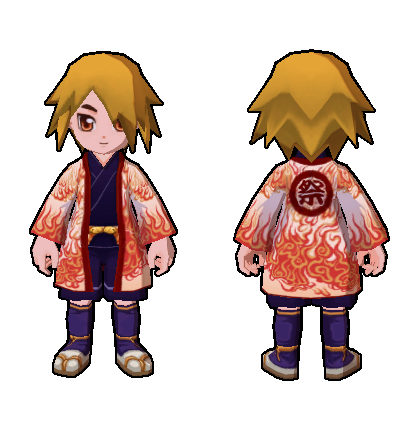 I have a few others as well (incl. 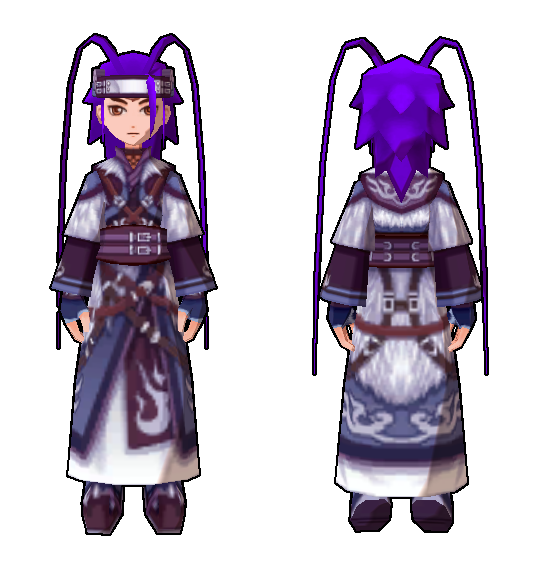 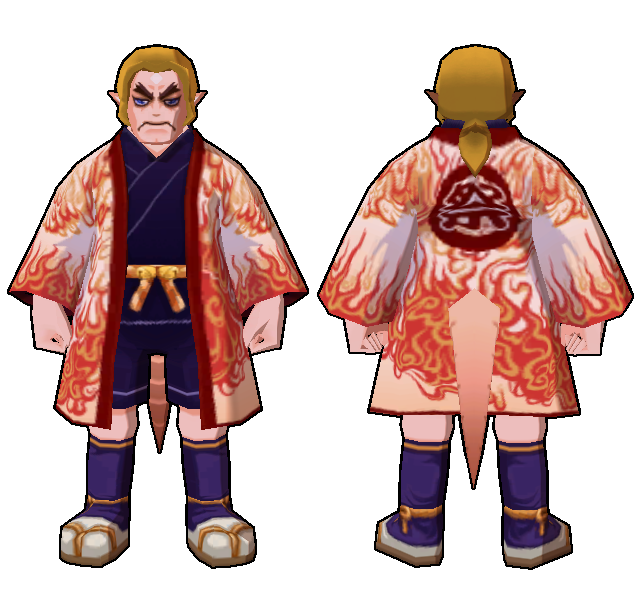 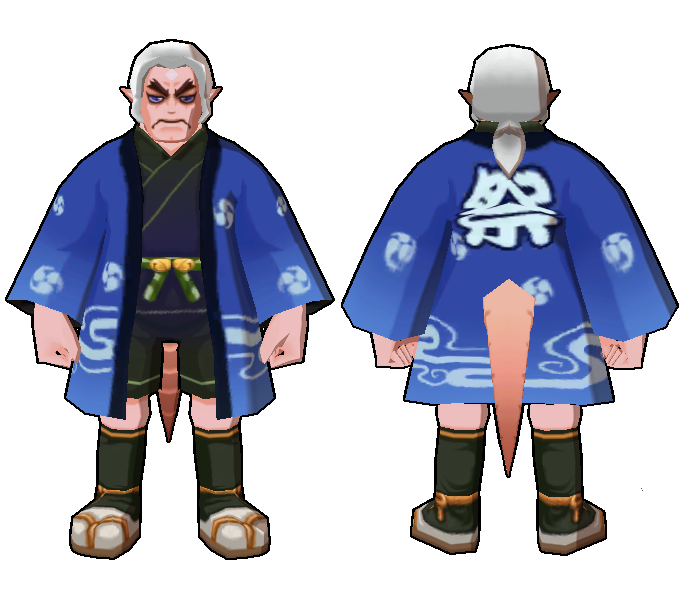 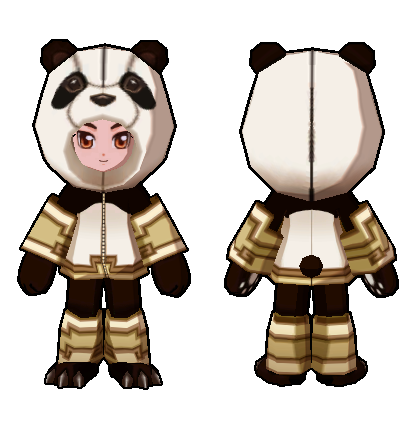 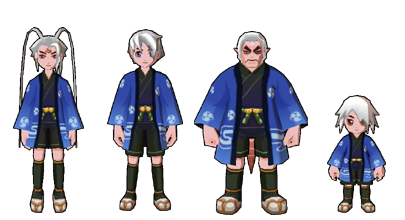 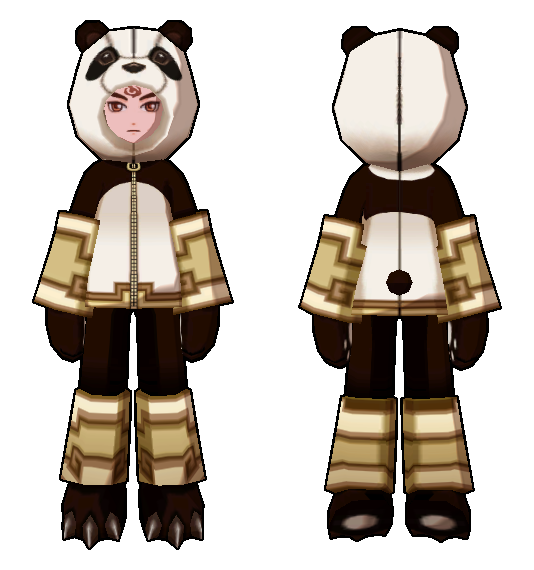 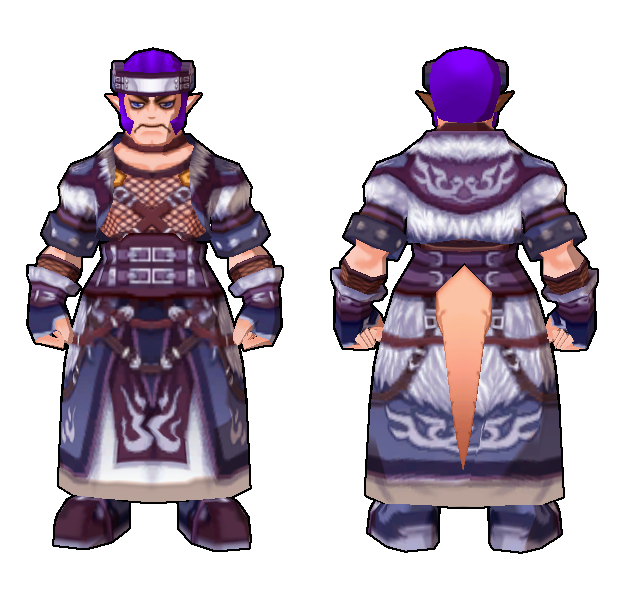 what should be upgraded hla robes for all male) but because they have a pants glitch I am waiting for more information/actual testing before I put them up. 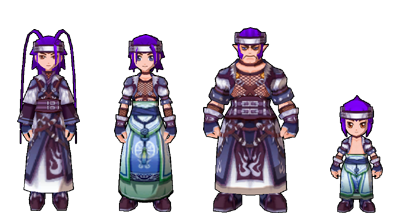 Thanks to Saphiranna of Sapphire (16) and [.Knight.] 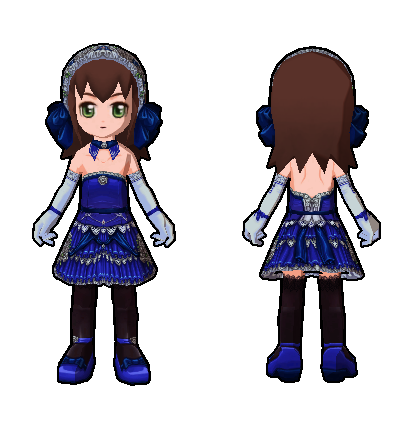 of Sapphire (4) for modeling these costumes for the site. 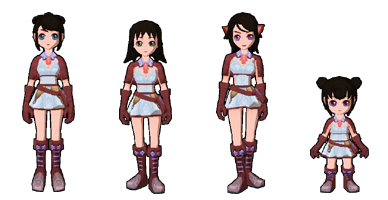 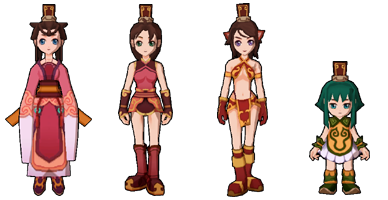 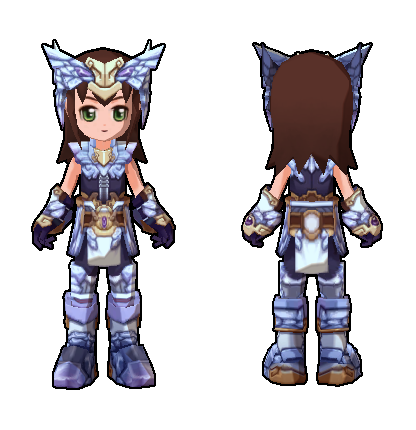 It should be noted that the Winter Lady Costume is currently glitched on Sylph Female and Shura Female, but I have uploaded the pics anyways. 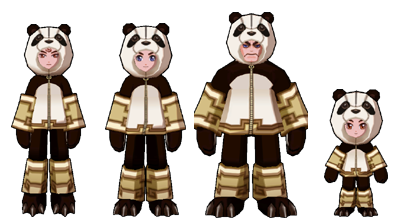 They will be replaced when the glitch is fixed. 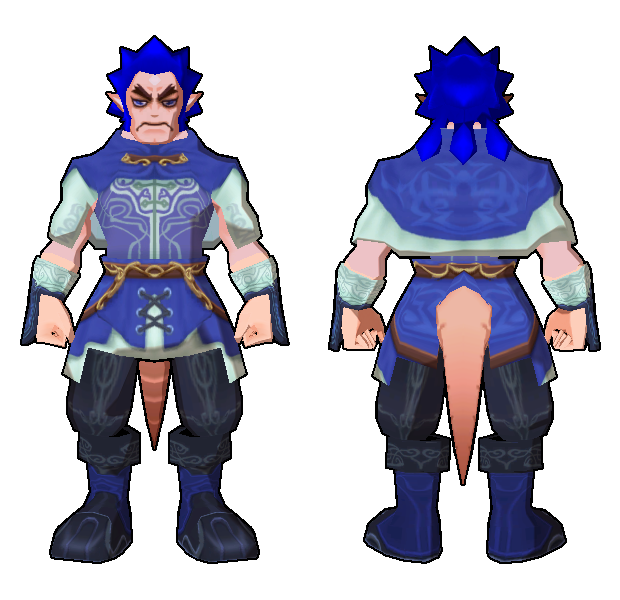 Also, the 'Dark Bounty Hunter' should be clarified as not being the same costume as the costume previously known by that name on this site, which is now known as 'Dark Blue Bounty Hunter' on this site. 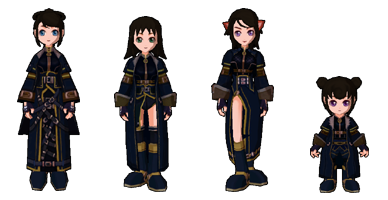 You can see them side by side on the costume pages (Dark Blue one has a Dark Blue icon with Light Blue edging, Dark has a Black/Darker Blue icon with Gold edging). 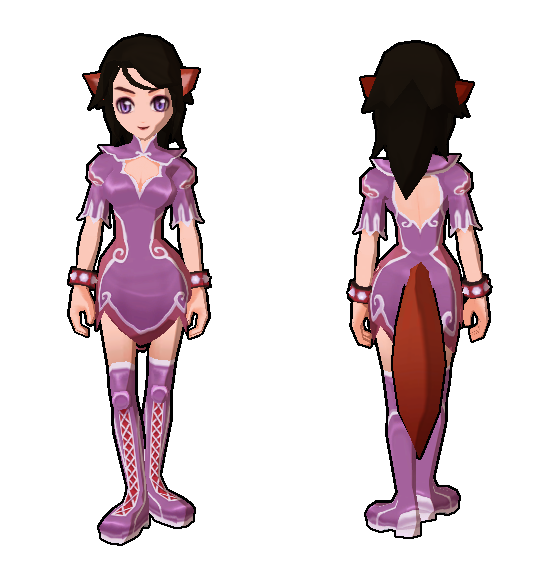 Thanks to Linz of Onyx (4) for modeling this costume for the site. 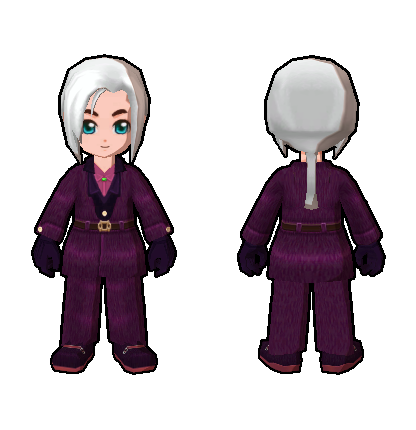 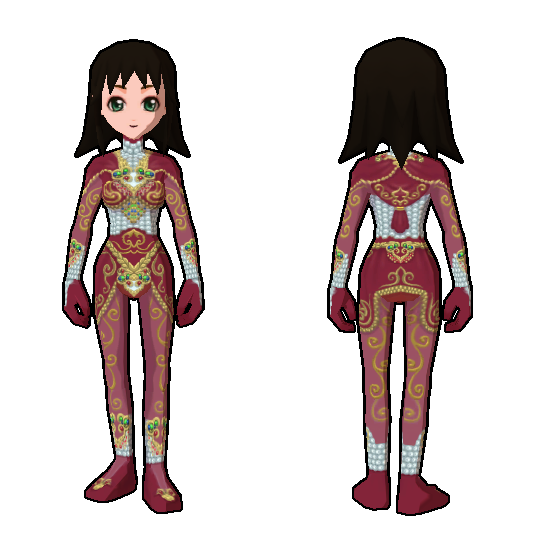 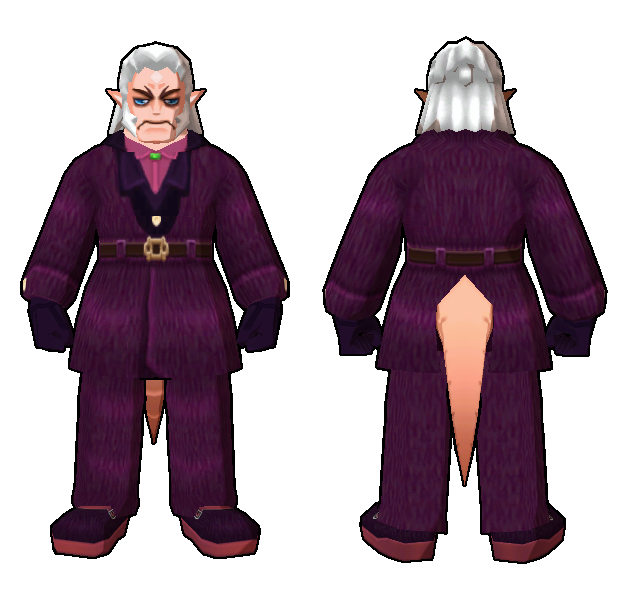 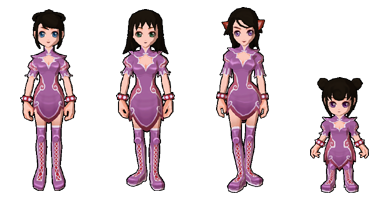 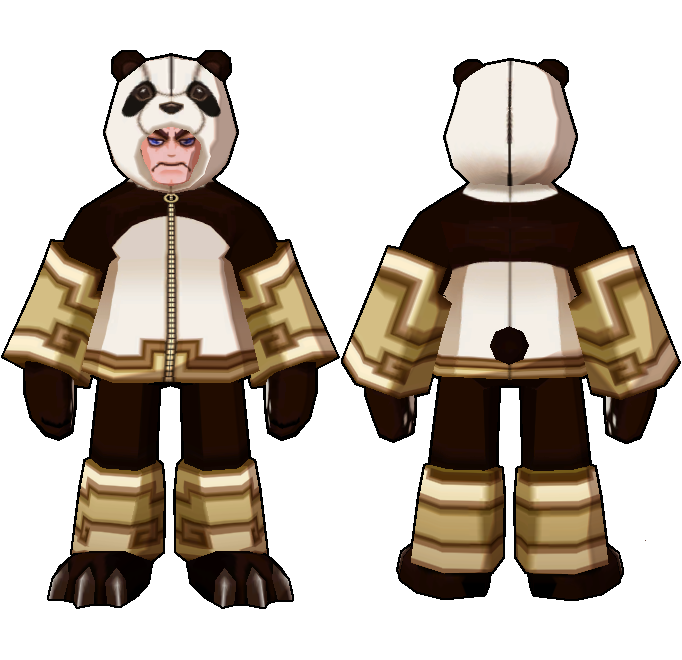 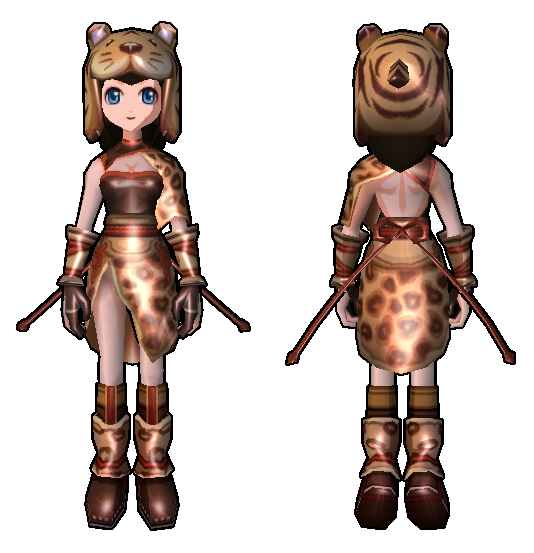 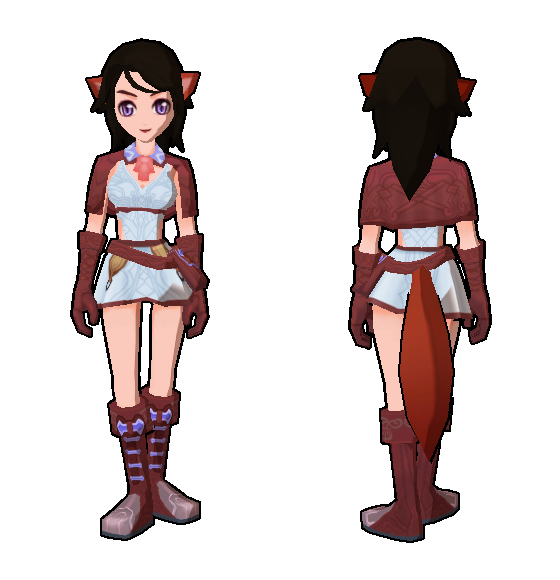 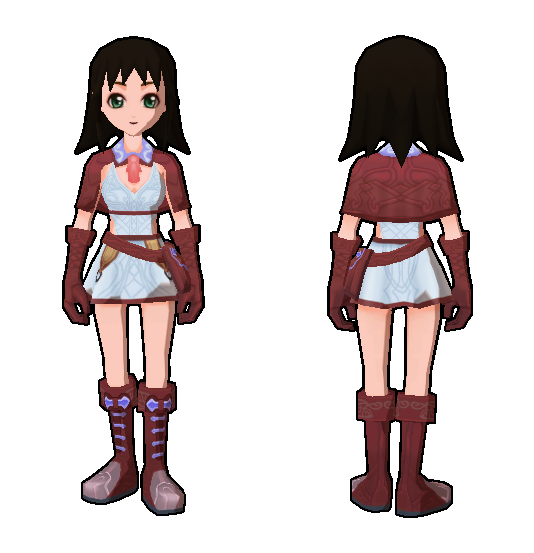 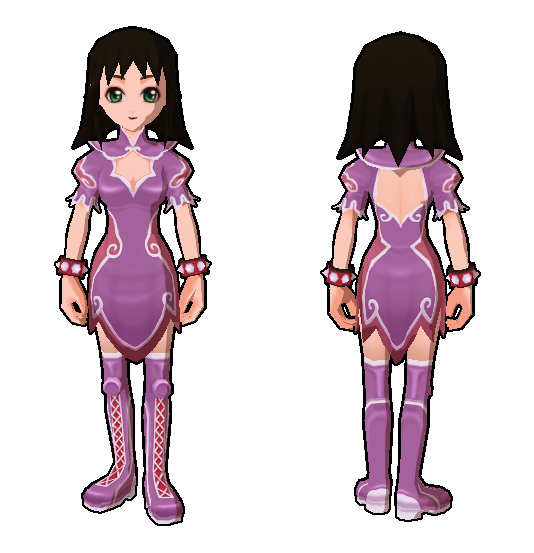 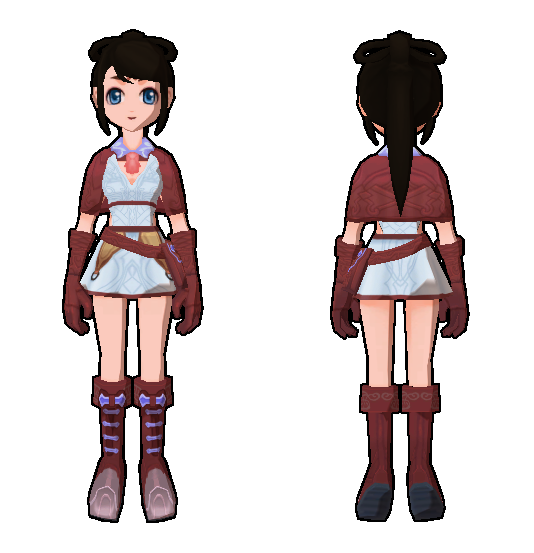 Thanks to Starwind75043 of Sapphire (4) for modeling this costume for the site. 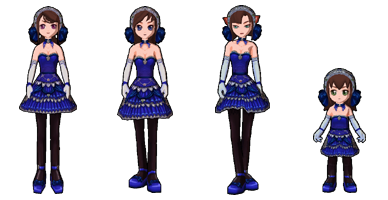 Thanks to Lugia12342 of Sapphire (4) for modeling the Aladdin Costume and ~Eluluu~ of Onyx (3) for modeling the HLA Dancewear. 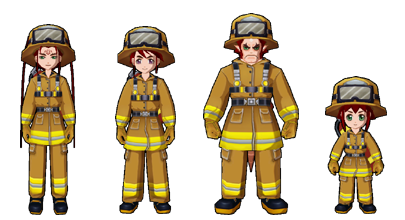 Thanks to Lugia12342 of Sapphire (7), Dash612 of Sapphire (4) and Fuggaak (+ Fugg's pants) of Sapphire (4) for modeling these costumes for the site. 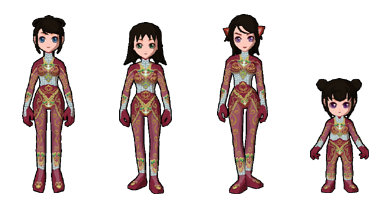 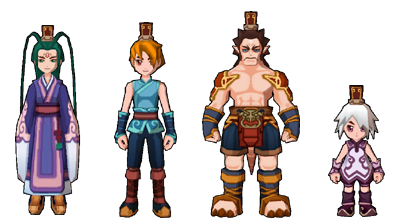 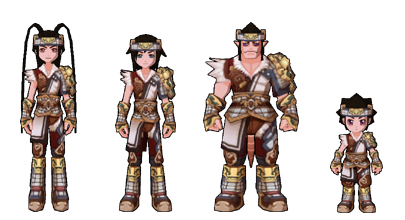 Thanks to my mules, Shufei (1) and the two Shuras who were sacrificed in the process of modeling these armors for the site. 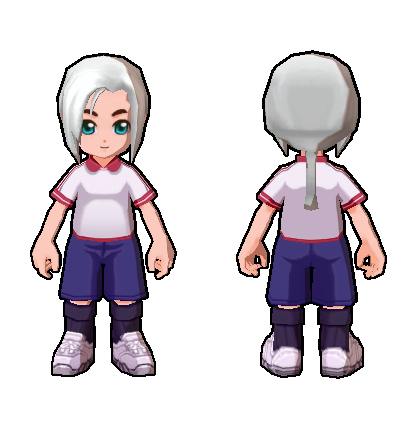 This is an addition which should probably have been on the site a long time ago, but somehow I never got around to around to it. 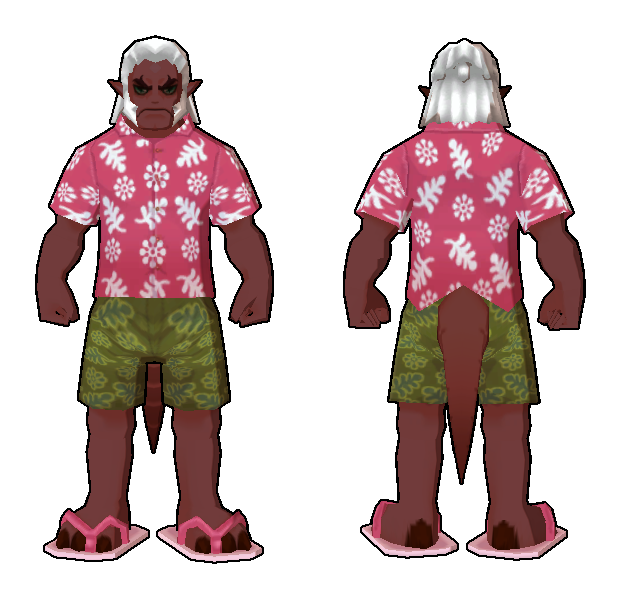 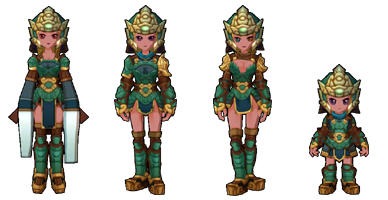 The Beginner Clothing pics can be found both on the main armor section selection pages for each race (accessible in the site header) as well as the 'Clothing' pages (for lack of somewhere better to put them, as it's not worth making a page just for them). 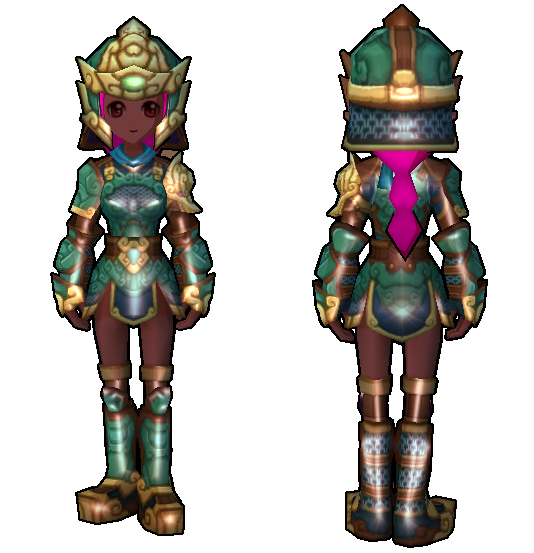 I also fixed all the obsolete/broken links to the old missing lists on the said armor section selection pages, they should now point to the up to date lists. 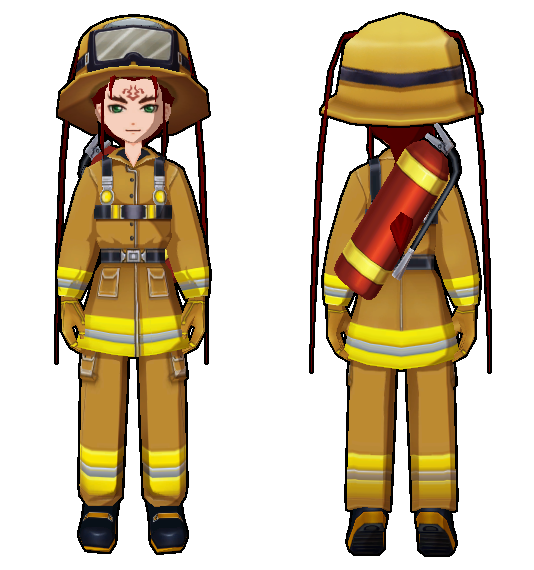 Another Male costume update is also on the way and should be up either later tonight or (more likely) sometime tomorrow. 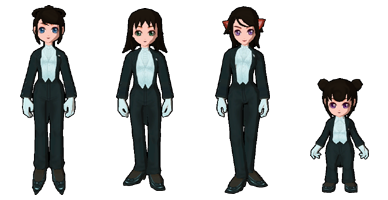 Thanks to |~Fayt~| of Sapphire (10), Arika_Yumemiya of Sapphire (4), and Lugia12342 of Sapphire (4) for modeling these costumes for the site.